Martha's Favorites: WHITE WEDNESDAY AND I JUST DID NOT HAVE TIME! Hi Ladies: It is White Wednesday and I blew it. I hate to miss days like this. I am so sorry. I have been a little busy. By the way, The thing I was so worried about, that was going to happen Tuesday, came out fine. I feel that I even got a miracle. I do promise to tell you about it one day. Just not ready for all the emotions right now. Thank you for praying for me, God answered. You are the best. Now all I have to do is get though tomorrow's fast and the "drink". I feel like God has told me there would be no more "mass" so, I just going to believe Him. Surgery scheduled 7:00 am Friday morning. Today, I had lunch with my friend Sharon who just had eye surgery. She is doing very well and it was a great time together. On the way home from her house, I passed my favorite Thrift Store. I only go to that store when I am in Burbank, visiting her. So, I just had to stop. It would have been a sin not to, don't you think? Anyway, as luck would have it, I found a few things. 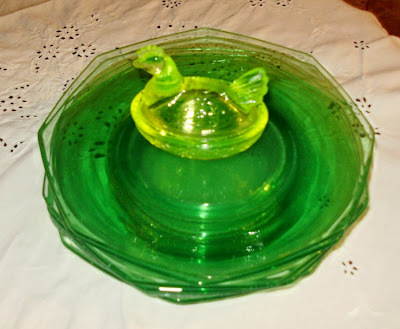 Did I ever tell you I collect green depression glass? 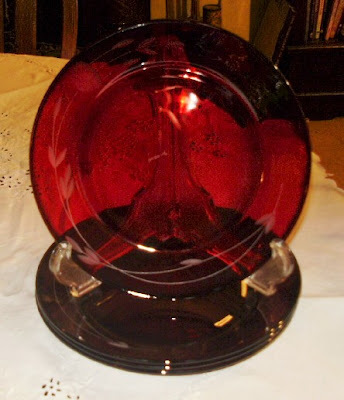 I also collect the cranberry depression glass, which is harder to find. I know I have told you I collect tea cups. Well, I love to give high tea parties. You can't have high tea without the small silver butter knives! I was lucky enough to have found some of those as well, to add to my growing collection. Then, there was the Vaseline Glass roaster, I found. It was a lot of excitement for my little heart, but I some how managed. 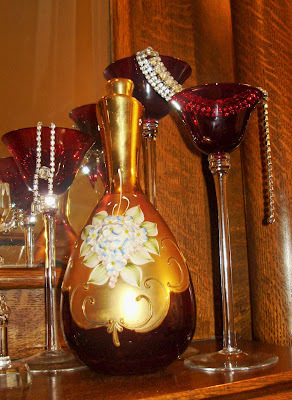 (LOL) I took some pictures of my treasures and some, of the new look for February around my little home! On the way home from the thrift store, I stopped at a friend's house for about 10 minutes. She has breast cancer and just needed hugs. So, since hugs are free and fun, she got one. Last but not least, I went to church to decorate for February. Like my home, the church gets a monthly make over. I love doing that! So, I am a little tried, and need to rest for Wednesday night service. I'm in agreement with others as we lift you up in prayer on Friday. Your day was a full one, no wonder you were tired and needed to put your feet up. Thanks for sharing your finds. You are such a sweet person and a good friend so I think you need a big hug, too! Love all your collections. Will say special prayers for your surgery and for wonderful results and a healthy happy life! Hope all goes well for Friday, I'm sure you will be fighting fit soon. You are a very sweet soul, Martha. I'm glad Tuesday went better than you'd thought. I belong to a big prayer line, should you ever need lots of prayers. It takes me but a minute or two to add your name and prayer request. 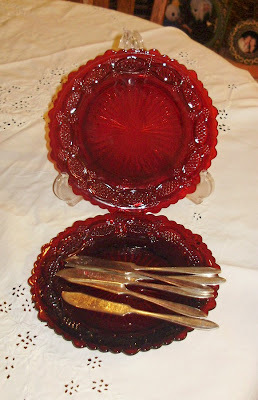 Is cranberry depression glass different than ruby glass? It's all so pretty! Oh sweetie, don't apologize for being one busy woman. I had to pull back and I only post about once a week. A large workin' farm is a busy and demanding place. I just wanted to thank ya'll for your visit and hoppin' on my blog. I sure hope ya enjoy the ride! Know that your on my mind and in my prayers. Isn't it just great when God gives you that peace and you know that you know it's gonna be alright! God bless and please keep us updated! Whoa, back this post truck back up. Surgery? Well, gosh, please keep us posted. And you are going on my prayer list. OK? On a total non-dramatic note I love your pictures....and the picture of that cupcake to the right of my comment. I think I might have forgotten lunch today. Martha~I hope all goes well..... you are so gracious to bring others hope. Sometimes things can become difficult. Leaving a need for support from our bloggy friends. I will keep you in my thoughts. This is a lovely and uplifting post Martha. Thank you again for sharing. I hope all goes perfectly well for you. I will be thinking of you. Your photos are fab. I love the plate with the lady on it! I love your cranberry glass ware. We all love a great find! I don't know what has been going on with you health wise.. but I hope and pray that all comes out well. 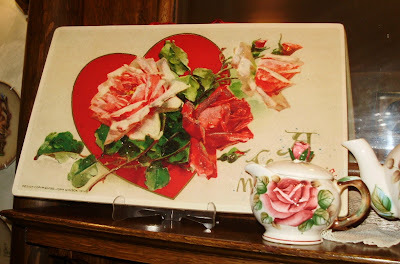 Love your beautiful cranberry and green glass ware. so beautiful. Glad that Tuesday turned out fine and my thoughts and prayers are with you for Friday, hope everything turns out well, dear friend. 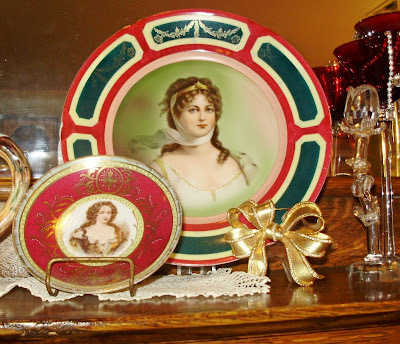 Gorgeous reds and the cranberry plates and vaseline green glass and hen...I love them all.